Take shelter under one of the beach huts and enjoy the view of the ocean. Summer is almost here, ready to set us on our way to amazing destinations in Palawan where we can make the best experiences possible. We’ve looked forward to this warmest season of the year for months, and finally, long days of island fun, beach trips, and that cold dessert halo-halo to relieve the stifling heat are ahead of us. Of course, the first thing to do to have more fun is carving out TIME. The second is taking out pen and paper and writing down a (bucket) list of what you want to do, when you want to go, why you want to go, whom you want to go with, how you’re going to head out of the busy city, and where do you want to go. We know there’s a lot to see outside the province, but have you made Palawan your own travel destination? If you haven’t, summer is the perfect time to do exactly that. 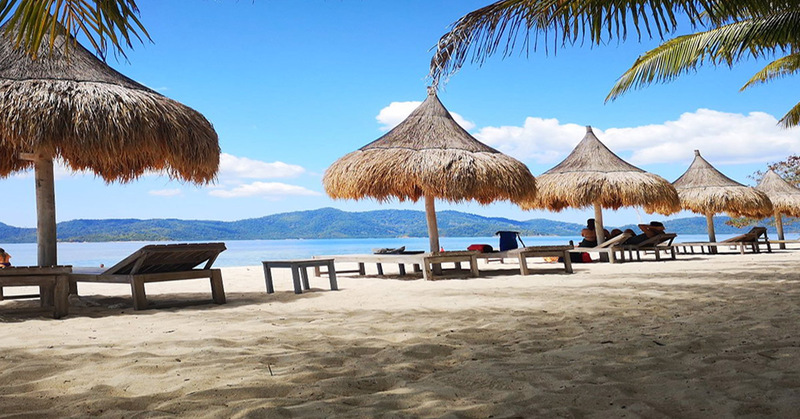 For your next island adventure, we highly recommend you to visit Inaladelan Island Resort in Barangay Port Barton, San Vicente. BOAT RIDE TO THE ISLAND: Off to Inaladelan Island Resort in Port Barton village, San Vicente, northern Palawan. The resort has its own boat which could make traveling to the island destination easy. Port Barton is a beachside enclave on the north-west coast of the island of Palawan in San Vicente town. Travelers who have gone to the place described it as “laid-back” — quiet, relaxed and easy going. For us, a visit to the place would definitely mean increasing our productivity at work, boost creativity, and improve mood in our journalistic work. To go to Port Barton, travelers may either ride a bus, go on a van, ride a motorbike, or drive their own car. All buses and shuttle vans leave from the San Jose Bus Terminal near the New Public Market. From the center of Puerto Princesa City, the drive (145 kilometers away) can take 2.5 to three hours depending on the speed of the ride you chose. Under 100 kilometers per hour is the safest, though. Tongue-twister that’s how the island resort’s name “Inaladelan” goes for us. It’s difficult to pronounce, especially rapidly, because of the occurrence of the same sound, yet charming and interesting enough to communicate what the spirit and character of the island. The owner and the locals said the name originated from the Filipino term “ina” for “mother” and “lan” derived from the word “island.” As a mother island, Inaladelan is a source of inspiration that brings unity and harmony with the surrounding environment where visitors can mellow out, put their feet up and settle back. WELCOME, Inaladelan Island Resort! White sand beach, blue waters, clear sky, cool sea breeze — they’re waiting for you in this beautiful island spot in Port Barton, San Vicente. From the sandy shores of the coastal barangay, the Coast Guard District Substation serves as the jump-off point to Inaladelan. If you’ve made reservations, it has a boat that’ll be ready to take you across turquoise blue waters to the destination that’s only 20-25 minutes away. There is something in the wind the minute we rode the boat to Inaladelan: it’s the aromatic smell of the sea hitting our noses and sweet thoughts of what to look forward to on our first visit to the place. Inaladelan is a 12-hectare property that’s popular among the residents of Port Barton because it used to be called German Island. It’s nirvana in the northern part of the province for having a white sand beach outspread, coconut and other tropical trees that stand verdant and form thick sunshades, and strikingly clear and clean surrounding waters. 1. SLEEP – Like what we’ve said, hammocks are all over Inaladelan, you can find your own spot to just relax and commune with your thoughts and Mother Nature. If you’re tired on doing that, tap on the power of sleep to re-energize you by listening to the natural sound of the waves kissing the sands. 2. SNORKELING – Doing this may get you a chance to encounter the island’s resident sea turtles (pawikan), especially in January during their hatching season. The resort runs a sea turtle conservation program, and though it offers watching events, it cautions visitors that encounter must be coordinated with them to comply with the policies. Inaladelan’s rich marine environment is home not only to the sea turtles but also schools of pelagic fishes and other wildlife dwellers. So don’t forget your snorkeling gears. 3. KAYAKING – The serenity of the surrounding waters is perfect to get that muscle at work and row your kayak. For newbies, the resort staff can assist you as you learn to paddle the canoe. It is a good way to commune with nature because the silence and small waves could give you the chance to experience solitude. LEARNING HOW TO KAYAK: Here’s this writer kayaking over crystal clear waters surrounding Inaladelan. 4. SUNBATHING – You’ve got time in this island resort to tan your skin sitting or lying. The sun will help you unleash that mood because “moderate” sun exposure at healthy levels is not only safe but necessary. Vitamin D can help lower your risk of some types of cancer. No wonder, most of the tourists we saw on the island were really soaking under the sun. 5. CUDDLING – Inaladelan’s romantic atmosphere is ideal for couples who want time for themselves. With its quiet environment, honeymooners can hold each other close as a way of showing love and affection. Studies said cuddling has benefits that could save relationships and “the solution is in the simple things we do.” It relieves stress, good for our health, improves communication better, and shows support may he/she be your significant other, a friend, or a family member. 6. EATING – If you think your gastronomic choices are limited because it’s an island, we’re telling you, you’re wrong. Imagine sand, sea, sky, and everything grilled from meat to fresh squid and fish. Veggies and fruits? Ask early and you shall be given. Make your early booking and the resort’s amiable staff will make sure they’ll have everything ready for you when you get there. 7. CAMPING – The island resort provides camping tents with foam beds and pillows to make you feel comfortable on your stay. What’s good about this experience is you wake up with the amazing view of the ocean and the sunrise, the rosy fingers of dawn that turn night into a new day for you. 8. PRAYER/MEDITATION – Yes. The place is good for spiritual upliftment. Castaway. But to be able to do this, we recommend that you stay overnight on the island. You can be like Tom Hanks in the movie Cast Away. When all the tourists are gone at around three in the afternoon, you can roam in the resort, find the perfect spot and be with your God. That’s a nice feeling — to achieve a mentally clear and emotionally calm state. 9. BREATHE – Maybe you would ask, “Do I really have to do it in Inaladelan?” Yes, we’ll say. Take in the island’s fresh air to rejuvenate you. It sounds a little ridiculous, but take air into the lungs and then expel it. Just following and doing it is not bad. Our body’s system needs the novelty of the act to restore, to give us back our sanity, and to make ourselves new again. 10. SWIMMING – Water and swimming are two of the greatest passions of Inaladelan Island Resort. While in the place, you can own the sea and swim to keep fit and stay healthy. In short, its vacation mode and mood while building endurance and muscle tone in crystal clear waters amid Port Barton’s pristine island environment.